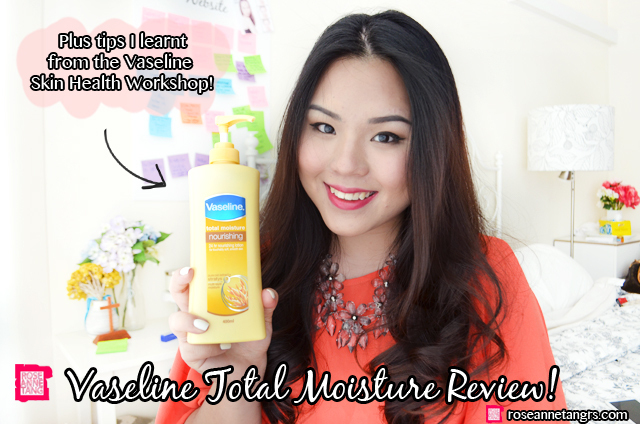 Vaseline Total Moisture Review & Vaseline Skin Health Tips! 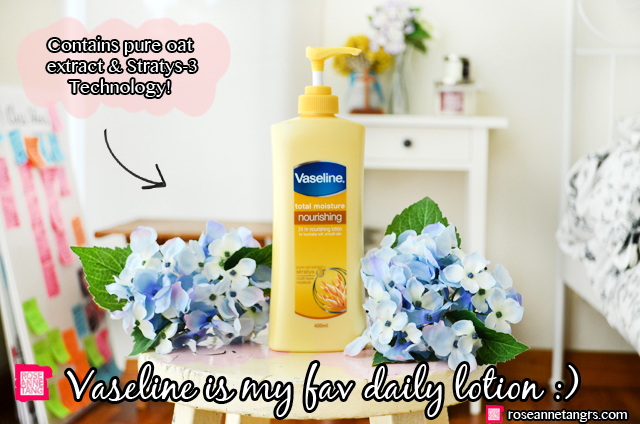 Today I want to share with you my latest lotion obsession – the Vaseline Total Moisture! This is such an amazing product and I have loved slathering it all over myself day and night. Vaseline is easily the expert in healing dry skin. I’m sure we all know of the very famous petroleum jelly that has so many uses and their varied and effective range of lotions! If you haven’t heard, the Vaseline Total Moisture is an amazing lotion that is known for their Stratys-3 Multi-Layer Moisture technology. Unlike other moisturisers that leave a greasy feeling, Stratys-3 is the first moisturising complex that infuses moisture at the top, core and deep down layers of the stratum corneum layer of your skin (your surface skin!) It penetrates these layers and by doing so, it effectively heals dry skin! Despite delivering superior moisture into these layers, this lotion still gives you a silky feeling that makes this moisturising technology one of the biggest breakthroughs in the last ten years. Vaseline Total Moisture comes in three variations – Aloe Fresh, Cocoa Glow and Nourishing (which is the one I love the most). It combines pure oat extract and the Stratys – 3 technology and smells absolutely amazing. Let’s put it on! I put this the moisturiser on after I shower and before I sleep at night. I love it because it smells really good and has a great texture. It doesn’t feel heavy or sticky and glides and absorbs into your skin extremely fast. My skin feels soft, supple and smooth after application. Back in the day, I have to be honest that I never really got into using a body lotion just because I get really lazy but now I know how important it is to do it. Your skin gets dry to due to many external irritants like pollution and even air conditioning. It’s important to keep it happy! 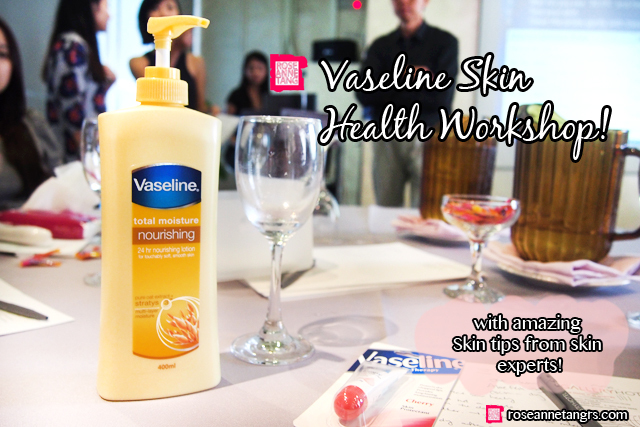 Before I really got into using Vaseline, I was invited to the Vaseline Skin Health Workshop! It was a great time to learn new tips about skin health thanks to the experts who were there including Dr. K.V Ratnam, of Ratnam’s Allergy & Skin Centre and also John Goh who is Vaseline’s Research & Development Manager. 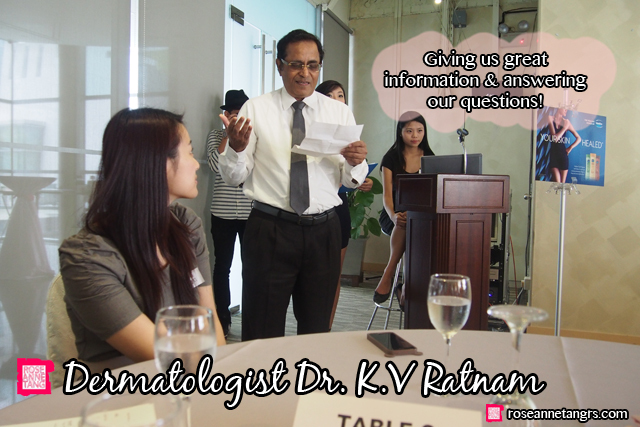 I learned so many useful tips from Dr. K.V Ratnam. For example, it’s best to apply moisturiser 3 minutes after you step out of the shower to that your pores can absorb the product best. Did you also know that putting a cup of water in a room could actually help with your skin too? It’s a trick that may Korean women like to do and it does have some backing since it makes the air more humid that can counteract dry skin. Dr. K.V Ratnam also went in depth into the anatomy of skin structure and also the causes of dry skin. He also answered our personal skin questions. I asked him which to apply first – acne medication or moisturiser? He said that we should apply acne medication first and then moisturiser and it shouldn’t affect the medication! 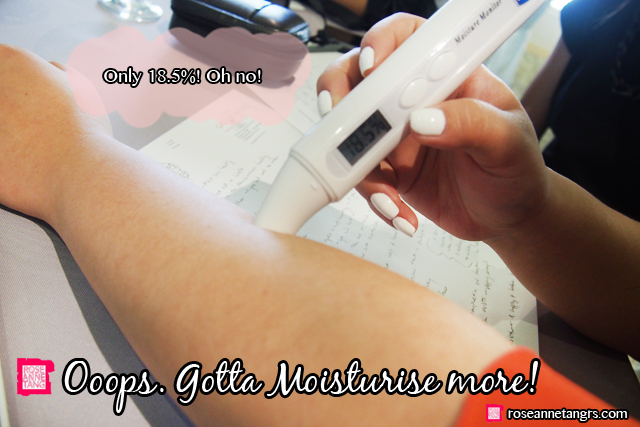 We then took a little moisture test to see how much moisture is in our skin using the Vaseline Moisture Monitor! 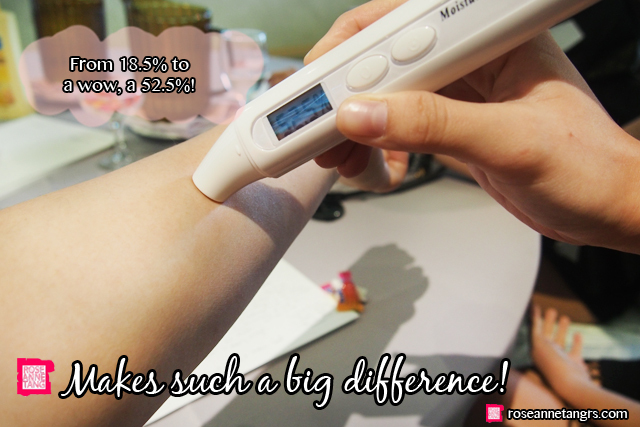 All we have to do is put this little thermometer looking object to our skin and read the percentage. At first mine came out to be an 18.5%. Most people scored around that area! Then we applied the Vaseline Total Moisture to see if it would make a difference! I applied it to my entire arm and make sure you apply it generously too! Another tip we learned from Dr. K.V Ratnam was that we should always apply moisturiser as generously as we can – with at least a film over the skin to reap the full benefits. Let’s see! Look! I got a 52.5% after application. I was pretty shocked and astonished. This was after the moisturiser was fully absorbed into my skin. It makes such a dramatic difference! Overall, I had an amazing time with Vaseline that afternoon! 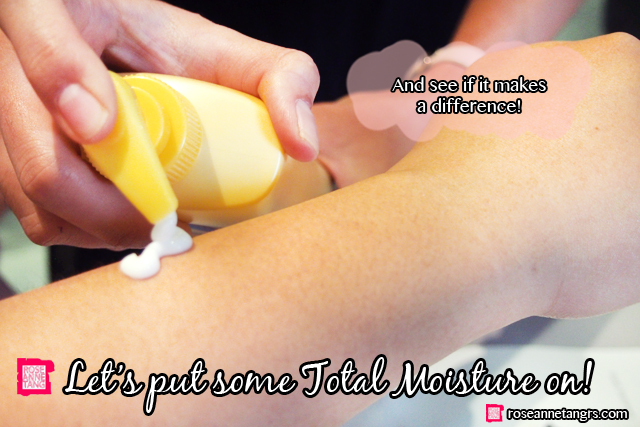 I really do love the Vaseline Total Moisture! I have all variations and my favourite one is Nourishing because I like how soft I feel and it smells too good to resist! You should for sure check it out the next time you’re at the stores! Hope you liked this post 🙂 Be sure to head over to Vaseline’s Facebook Page for more tips on maintaing healthy skin! My Experience at the Aveda Experience Centre!